Why Sarah Geronimo can't finish the scene with Piolo Pascual? Home » Movies » Piolo Pascual » Sarah Geronimo » Showbiz » The Breakup Playlist » Why Sarah Geronimo can't finish the scene with Piolo Pascual? Kapamilya pop star singer and actress Sarah Geronimo can't finish her scene with actor Piolo Pascual at their upcoming movie, "The Breakup Playlist." Piolo Pascual is the leading man in the new movie project of the actress which is the first-time to become her partner in the film. Star Cinema released the 30-second movie clip that shows how the same scene took 3-takes. Sarah Geronimo can't focus on her act while making an eye contact to the actor. "The Breakup Playlist" revolves around two musicians -- an aspiring professional singer played by Sarah Geronimo, and a rock star portrayed by Piolo Pascual -- who collaborate and fall in love, according to Star Cinema. The movie clip of "The Breakup Playlist" was released on Monday, April 27, 2015. The premiere date for "The Breakup Playlist" has yet to be announced. Director Dan Villegas noted to all that viewers can expect concert or gig set-ups in the said movie. 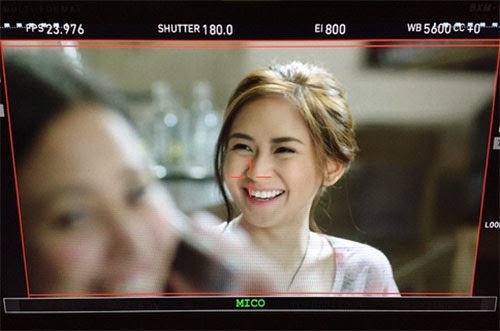 Comments or suggestions about "Why Sarah Geronimo can't finish the scene with Piolo Pascual?" is important to us, you may share it by using the comment box below.